When I was growing up, we had a pretty big backyard with a huge area to grow plants in. We would grow strawberries, peppers, tomatoes and herbs. When it was too cold in Ohio to tend a garden, we would move inside and grow simple items inside the house. Mom always had live plants all over the place and I have a love for them to this day. If you are like me and have a bit of a brown thumb, here are some pointers for you! Warmth: Most houseplants do best when the temperature inside is warmer during the day and cooler by a few degrees at night. Light: Virtually all plants need light. The key is to find how much and how strong the light should be. Check online or with a grower for the specifics for your particular plants. Water: Plants need to have moist but not soggy soil and they need less water in the winter. Humidity: Plants usually flourish in humid climates and even indoors they can get what they need. When it is warmer outside, the indoors is usually humid enough. During the colder months, you may need to have a humidifier in the room. Food: Plants need food just like we do and they can do poorly if fed too much, just like us. It is better to feed a plant too little than too much and they should never be fed when dry. Indoor Gardens: If you just do not have the knack for growing plants indoors, you may want to consider an indoor garden instead. One of the best on the market would be the AeroGarden by MiracleGro. I got my love of plants from my mom but not her green thumb. I cannot grow a weed without killing it, which I guess is a good thing! I have tried growing a garden outdoors and all we got were some feeble sprouts that never grew into anything we could use. I bought the kids a little indoor garden kit and even that was a disaster! Thank goodness growing plants indoors is easy with the AeroGarden from MiracleGro. 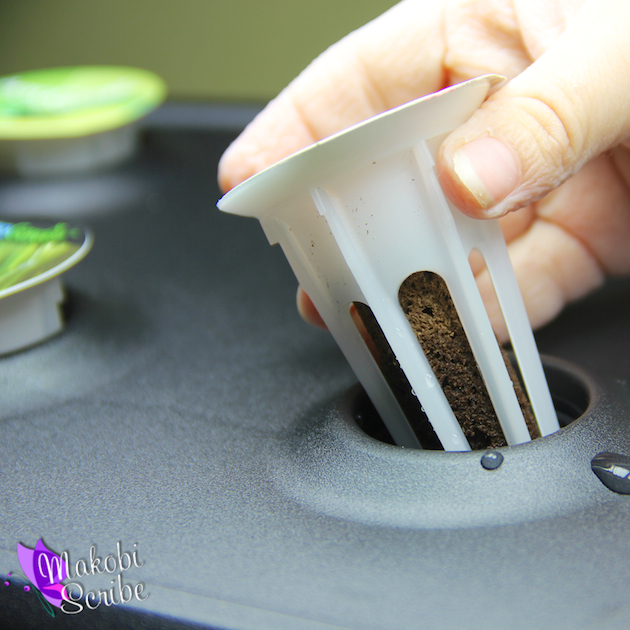 I received the Miracle-Gro AeroGarden Ultra which is a super simple digital indoor garden. You can choose to grow a variety of more than 70 pre-seeded lettuce, herbs, peppers, tomatoes and more. These are just like what you wold grow outside, so it is like having a mini-farm right in your home! You can cook with fresh herbs for a more flavorful meal and add home grown vegetables to soups, salads or on their own. I must admit, there is nothing like having a living garden right in your house for the entire family to enjoy. I will say the cats are ultra curious, so if you have pets, keep an eye on them, especially if they like leafy green things! The AeroGarden Ultra actually uses NASA proven technology which includes hydroponics which helps your plants grow much faster than in soil alone. The AeroGarden Ultra has the MyGarden™ control panel which is the very first ever built in display screen. It helps you go through each step you need to follow to grow the best plants you possibly can. It even has a feature that reminds you when to prune and harvest so you get the most out of your garden. You do not mess with buying or using dirt, which is great since you are doing this all indoors. 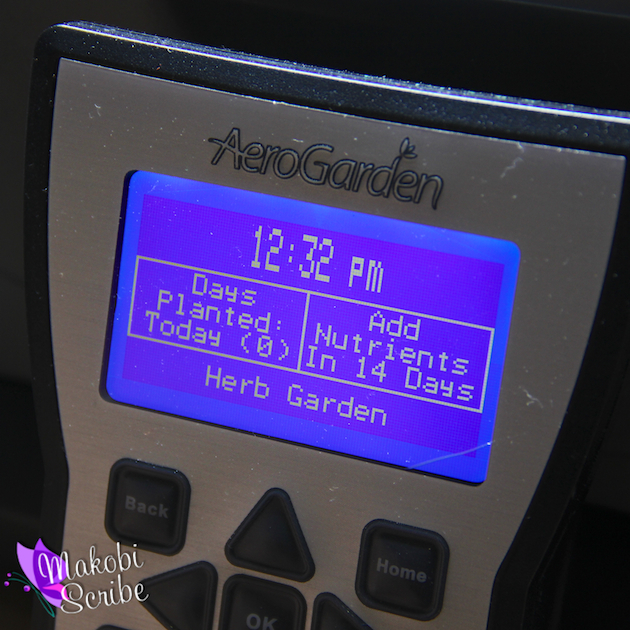 Because it is totally automated, you do ot need to guess when to water or feed your plants because the AeroGarden tells you! With the built in energy efficient grow lighting system, you do not need to worry over getting the proper amount of light for your garden. 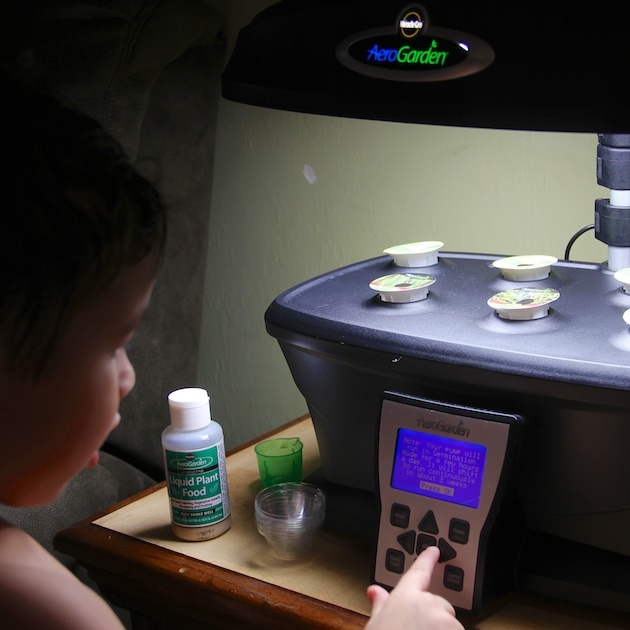 The AeroGarden truly is so easy to use, the kids were great helpers and have had fun interacting with our little garden. It took just a few minutes to set up, comes with the Gourmet Herb seed kit, liquid plant food and a Quick Start Tending and Harvesting Guide. You can ourchase the Aerogarden for $250 from the AeroGarden website, Amazon, Costco and other fine stores. Be sure to stay current with the latest from and follow them on Facebook and Twitter. I’d like 2 grow the Mighty Mini Cherry Tomato Seed Kit. I would like to grow mint. I would like to grow Chili Pepper. I really like the medicinal herbs kit and would love to grow those for use in cooking! I would definitely want to grow herbs. I’d love to grow herbs inside. I would to grow TRADITIONAL MEDICINAL HERBS SEED KIT. I am studying naturopathy, so this kit would help me out alot. Would love this to grown fresh herbs as I love to cook! I would grow a variety of their teas. I’d love to grow Golden Harvest Cherry Tomatoes! I have always wanted one of these! I would love to grow the Mighty Mini Cherry Tomato Seed Kit. I would grow the herbs to have fresh herbs available daily. I would like to grow Heirloom Lettuce Seed Kit. I love having fresh lettuce, even if just a leaf or two for a sandwich. I’d love to grow the English Cottage Seed Kit. I would love to grow basil. Thank you for the opportunity. I’d so love to get the strawberry kit. This is the last day to try! The strawberry kit my favorite berry. I would like one of the HERB LOVER’S SEED KITS. I’d love to grow the Basil in the Pesto Basil Seed Kit! Cilantro. I use it a lot in cooking so having it fresh on hand would be great!! I would love to grow the flowers in the mountain meadow seed kit. The Create your own Herb kit sounds like it would be perfect! I would love to grow my own spices that fit the needs of my family! I would love to grow cherry tomatoes! I would love to get the Heirloom Cherry Tomato Seed Kit and one of the herb ones. I would like to grow tomatoes and cilantro. I’d like to grow tomatoes, and peppers. Hard to choose just one item, but probably strawberries. I’d love the strawberry kit; I can taste them right now! I would love to grow strawberries. I love all herbs, but the first thing I will plant is cilantro. We eat a lot of strawberries at my house,so definitely the strawberries. I’d like to try to grow the gourmet herbs. Thanks for the chance. I would love to grow herbs! What a cool invention! I would first grow salad greens and lots of different herbs (especially medicinal types). I’d grow the “Love Blooms Seed Kit”. Thanks! I would love to get the AEROGARDEN GROW BOWL AND STRAWBERRY KIT! I’d like to try the Arugula. Would love to grow strawberries. I love the medicinal herbs set and the Heirloom tomatoes would be great, too. I’d like to grow a bunch of stuff but the first two things I would like to grow are the mighty mini cherry tomatoes and the fresh tea. The tea in particular sounds amazing. I love drinking tea so growing my own fresh tea would be really nice. Both hubby and I enjoy gardening and I know we would really enjoy the aero garden and get lots of use out of it. It would be very handy for growing so many things. Thanks for the chance to win this awesome product. I would love to have the fresh herbs﻿. Pesto Basil would be great. Strawberries! I love, love, love strawberries!!! I would like to grow kale! I keep a garden from very early spring to late fall. It’s one of my favorite things! If I had an Aerogarden, I’d grow an herb garden right in my kitchen. Love this! I’d like to grow tomatoes. The strawberry kit would be great. And I don’t have to worry about birds! I’d like to grow the mighty cherry tomatoes. I’d love to grow heirloom lettuce. would love to grow peppers herbs! I would grow lettuce and kale. I’d love to grow heirloom tomatoes, peppers and fresh herbs. So hard to decide between the heirloom lettuce kit and the strawberry kit. Heirloom Cherry Tomatoes for me! I would like to grow the gourmet herbs. I want to grow basil and lettuce! I’d love the strawberry kit! I’d like the gourmet herb seed kit. I would like to try the Traditional Medicinal Herbs Seed Kit. The Salsa Garden kit is my favorite! Thanks for the giveaway! I would like to grow the flowers. I would LOVE to grow the custom flower seed kit! Thia dragon and ghost peppers. I do now, but in a much more primitive way. I would love to have fresh herbs at my finger tips …. but those strawberries looked really good too! Custom herb seed mix is what I’d get. My rabbit loves dill, so it would have a lot of dill seed in it. The Strawberry kit my kids love strawberrys!! I want the strawberry kit! I’d probably use most the Italian Herb kit. I would really like to grow the Herb Lover’s Seed Kit! For me personally? Strawberries. All day long. For the hubby? Tomatoes & salad greens. I’d like to try the Custom Tomato & Pepper Seed kit! I want fresh strawberries in my kitchen! I would like to grow strawberries!!! I would love to grow cilantro, peppers and tomatoes so I can make homemade salsa! I would love to grow the cilantro﻿. I would like the custom tomato and pepper seed kit! I want to grow the strawberries! I would love to grow the Traditional Medicinal Herbs Seed Kit. How cool! I would love the Italian Herb Seed Kit. I use a lot of Basil and Oregano in cooking. I want to try the custom tomato and pepper kit. I have wanted one of these for so long1!! I’d love the Pesto Basil Seed Kit (6/7-Pod) for Indoor Herb Gardens! The heirloom lettuce kit would keep me eating healthy all the time! I would like to grow cilantro, jalapenos and tomatoes. I would try the tomato’s. I know it’s wildly ambitious, but I’d like to be able to grow orchids. I have never grown herbs or vegetables before. I have many indoor plants that I love A LOT! My new African Violet just bloomed it’s first flower and I feel like a new mother. I would love to grow a herb garden. I have been given it some thought. This would be perfect to start a herb garden. I would love to Rosemary and maybe some Dill. This would fantastic! I would choose the Crazy Catnip Seed Kit. My cats are cuckoo for the nip, especially if it’s fresh. Would love the Salad Lover’s Seed Kit! I would like to grow holy basil! I would love to grow herbs! I cook a lot, so this would come in very handy! I want to grow the Italian Herb Seed Kit. The custom tomato & pepper seed kit- we love salsa. I would love to grow the strawberry bowl. I would love to grow the strawberries and mini cherry tomatos. I would like to grow the herb lovers seed kit. Thanks! The tea kit sounds facinating. I would love to grow Italian Herbs. I would like to grow the Traditional Medicinal Herbs. Thank you for the super giveaway opportunity. Keep up the terrific blogging. I’d love to grow the little baby tomatoes! Or the catnip, that would be fun. So many possibilities really. Hope you have a great New Years Day! Peppers & tomato seed it. I’d love the herb lovers kit. I have herbs outside but this would be great for winter. I love cooking with fresh herbs, so I’d like to try growing the Gourmet Herb Seed Kit. Nice variety of herbs and flavors. I’d love the Italian herb seed kit! Yummm!!! I’ve always wanted to have my own fresh herbs to cook with! I would love to grow their salad lover’s seed kit. The International Basil Kit! I love basil and miss it so much in the cooler months! I would grow the custom herb seed kit. I’d love to grow basil and oregano. I love Italian cooking and use them a lot! I would love to grow mixed romaine lettuce! I would like to grow the heirloom cherry tomatoes. I would love to have fresh tomatoes for my salads year round. I’d love to try the Mighty Mini Cherry Tomato Seed Kit.
. Surprised there are no illegal substance mentions! I would love to grow tomatoes and basil! Love to cook and this would allow me to use fresh herbs year round. I like the Custom Herb Seed Kit for mint. I have good luck with tomatoes and peppers so now I just need the salad lovers kit to complete a nice fresh salad. Would like to grow herbs. medicinal herb set or strawberry kit! I’d like to grow mixed romaine lettuce. I would love to try the gourmet herbs, especially in the dead of winter in Montana! I would love to grow the Pesto Basil. The herbs of course, would use the all the time. I’d LOVE to try the tea kit! I would like to grow the golden cherry tomatoes or the medicinal herbs. The lettuce sounds good too. Love the English Cottage Seed Kit. so pretty. I would love to grow it all, actually. However, I guess cherry tomatoes would be my number 1! Custom Tomato & Pepper Seed Kit. Yum! I would grow herbs. I love the aromas even when I don’t cook with them. I would like to grow strawberries. I would like to grow the Herb Lover’s kit, I love seasoning my food with fresh herbs. I would use it to grow herbs, especially basil. I love using basil for cooking. I have a raised garden in the back yard of my apartment and could also use it to start my tomato plants and other plants to transplant to the garden….Thank you for this giveaway!!! This looks awesome….I would love to grow some strawberries and tomatoes. I have tried to grow strawberries so many times. I would love to try this. I would love to grow the mini cherry tomatoes. Heirloom lettuce for me I love salads at least every other day. Tomatos! I love home grown tomatos! Ive always wanted an AeroGarden! I’d love to grow the Traditional Medicinal Herbs Seed Kit. I love fresh herbs year round. Heirloom lettuce seed kit would be great to grow. I would love to grow the heirloom lettuce, I love salads! I would like to try and grow herbs in my kitchen. I would grow African Violets. I would Create My Own with Basil, Oregano, etc. ……good cooking herbs!!! Heirloom Lettuce would be great! I’d love to do the Herb Lover’s Seed Kits. Thanks! Heirloom lettuce! It’s too hot during much of the year to grow it outside. I would like to grow the Gourmet Herb Seed Kit. I would grow herbs or peppers. strawberries! and lots of herbs! The Mini Cherry Tomatoes would be what I’d like to grow. The Mighty Mini Cherry Tomato seed Kit! I would love to have fresh basil growing. We use it a lot. The reviews on their website were spotty – particularly in regard to growing salad. My understanding is the herbs were easier so I would go with the Herb Lovers Seed Kit. I would grow the herbs! I would love to grow the herb kit! I’d like to grow cilantro, basil, and parsley. I would love to grow Golden Harvest Cherry Tomatoes. Oh my gosh, I would love to grow tomatoes and peppers, but to have fresh herbs when I want them… oh, be still my heart! I want to grow herbs! I want to grow sweet bell peppers. I want to grow everything they have listed! I am so excited about this product because it looks like it would really work for me. I think I would start with the lettuce kit. Looks like so much fun! I’d love to grow the Mighty Mini Cherry Tomato! I’d love to grow the Sweet Bell Peppers! i would love to grow basil and thyme. I would try the Upland Cress! are both definitely going to be included in his birthday basket. Either the Traditional Medicinal Herbs kit or the Custom Tomato and Pepper kit! I would love either one! I would like to grow the traditional medicinal herbs. I would like to grow herbs. Salad lovers!!! Wow I would love to have fresh salad greens right here in my kitchen. Wonder could I do little grape tomatoes too? OH how nice would that be??? I’d try the Strawberry kit first. I so want to grow tomatoes! Oh I have been wanting one of these from the first time I heard of them. I would love to have the Herb Lovers Kit. I would get the salad mix and tomatoes. The fresh tea seed kit. I like the strawberry kit! I would like to grow the Holy Basil. I would get the salad lovers seed kit, we are a house of salad lovers. Fresh Tea Seed Kit would be awesome to grow and make into teas! I would get the TRADITIONAL MEDICINAL HERBS SEED KIT to grow herbs. I’d love the Heirloom Cherry Tomato seed kit! It comes with it’s own light, how cool is that? I’ve never had any land to grow anything in, I love this! The custom herb seed mix and the lettuces! I have wanted one of these grow light kits since I first saw one. I want to grow some cilantro. Also…looks like a lot of fun! Getting to old for all the outdoor gardening. I wish to grow medicinal herbs. Thanks bunches for a chance at the aerogarden! Can it turn my brown thumb green? Happy New Year everyone! For sure herbs. I dislike how expensive fresh ones are in the store. I’ve always wanted to grow the herbs in the Traditional Medicinal Herbs Seed Kit, especially cilantro. I’d like to grow the strawberries! I’d like to try the Mega Cherry Tomatoes Seed Kit.